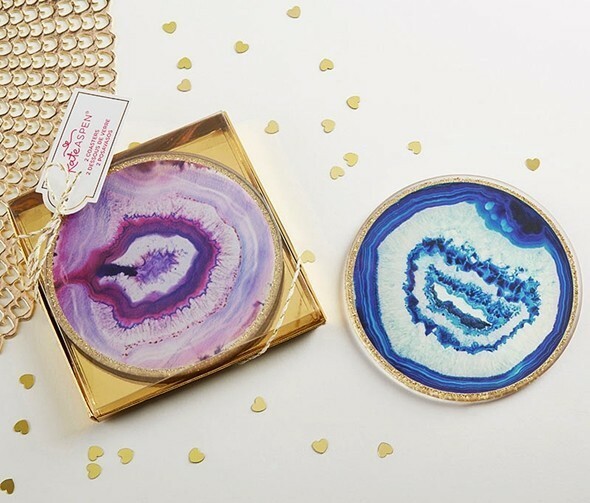 These distinctive round glass coasters feature stunning geode prints and are wonderful natural decor pieces that your guests are sure to treasure! The set of two (2) includes one purple faux-agate print and one blue faux-agate print coaster with gold glitter border all along the edge. Hand wash only. Each pair comes packaged in a display-topped, gold-foil base gift-box finished with gold-striped twine and a coordinating Kate Aspen gift-tag. PLEASE NOTE: Pictured confetti and placemat are not included. Sold as a set of two (2) and prices quoted below are per set. Please also note that while we package all glassware with extra care, we cannot replace any glassware that may break while being shipped by UPS or FedEx. It's always a good idea to order extra quantity (5% is the rule of thumb) to account for shipping damage or unexpected guests.